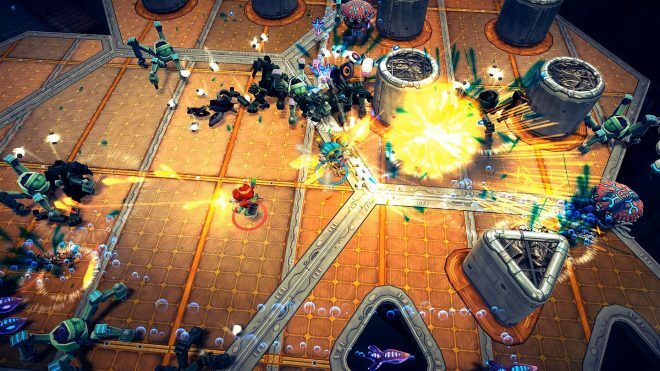 Assault Android Cactus Review: Run & Gun Fun! Twin-stick shooters have the player moving around with the left stick while aiming a certain direction and shooting with the right stick. While very simple in concept, the delivery seems to range anywhere from sloppy to solid. Witch Beam’s Assault Android Cactus takes the twin-stick shooter formula, adding only an additional few buttons to keep the flow of the controls consistent and even improves the overall feel. Players use the right stick being to point your character in a particular direction to aim, the Right trigger to shoot, and the left trigger to switch weapons. In Assault Android Cactus, you play Cactus, an android, who is sent by a police agency to investigate the Genki Star, a space cargo Freighter ship, which has unexpectedly stopped transmissions with the outside. Upon approach, Cactus notices that the Genki Star has armed and locked weapons on her ship. Despite her commanding officer’s orders to abandon the mission, Cactus does the unexpected by crashing her ship through a wall landing inside the Genki Star. Upon exiting her ship, she meets up with three other Android crew-mates: Lemon, Holly, Coral. Her crew advises Cactus that the core admins of the ship have gone haywire and taken over the ship and Cactus vows to stop them and restore order to the ship by any means necessary. Lock and load! Fun for All – One of the strongest aspects of Assault Android Cactus comes from the character design. The game starts you out with Cactus being the main character, but allows you to play as 3 of the other crewmates. As you progress through the game and defeat the boss found at each of the 5 zones, you will unlock another character. Each character has their own unique primary and secondary weapons, and there is something available for everyone’s playstyle. There are nine total playable characters; some excel in close range combat whereas others are optimal for keeping enemies at a distance. The last character you unlock is a combination of both with her primary attack being good for long range and then a sword swipe that pierces through an enemy but only connects at close range. The Playing Field – Assault Android Cactus features five zones, each with four basic survival levels that pit you with destroying an onslaught of enemies assaulting you from all angles. These zones also feature a boss level where you will fight a unique character that includes dialogue to further the story. Twenty-five levels might not sound like a lot, but as you progress through the game, the levels become longer and more involved. Even the elements of each level are different as you progress through them. No two levels are the same. Whether it is a different layout or different hazards in the levels, each level you play through in the game will have something unique to make the experience challenging. The most unique and challenging level for me came from a floor that was covered in tubes that would shoot fire. While there was a pattern that needed to be followed to stop me from becoming toast, what made it challenging was the constant focus I had on the enemy rather than on the floor and vice versa. EX Options – Extra Options are features that seem to have been lost to a lot of games nowadays. Assault Android Cactus includes an EX Options list, full of different effects and add-on features you can purchase with coins collected during the campaign. Most are just cosmetic, but there are a few that can help you out in a pinch if you’re stuck in a level and are having trouble progressing such as the ability to have three AI teammates play along with you. These boosts, while very helpful, stop you from earning any score (and a place on the leaderboards) as long as they are active. There are also a few different modes outside of the campaign. 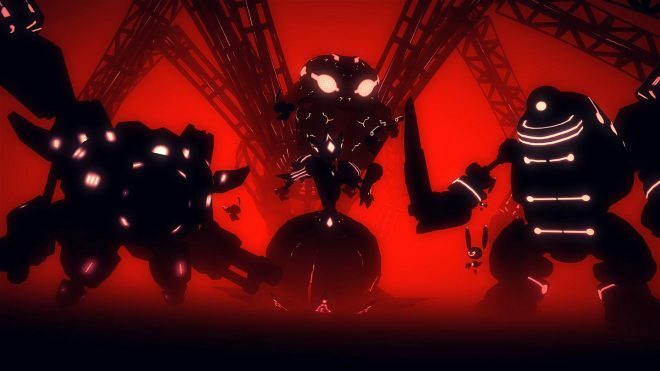 Infinity drive has you running through levels of enemies trying to stay alive as long as you can (until your character’s battery dies out), whereas Boss Rush, has you fighting the five different bosses of the game in one go. 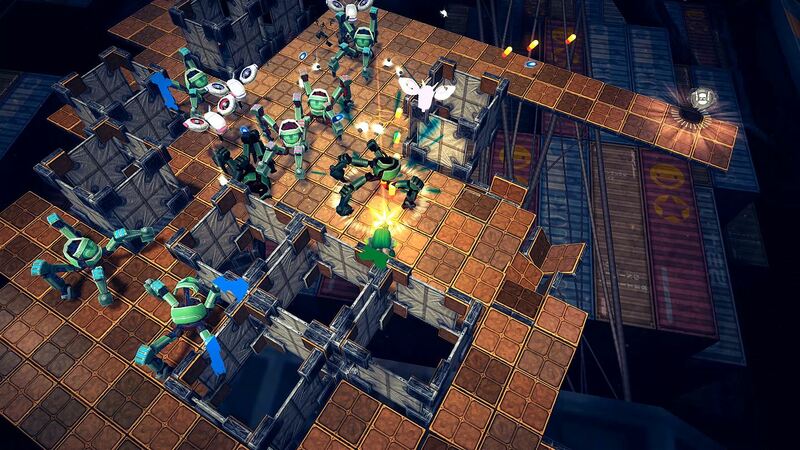 Raising the stakes – Assault Android Cactus is a game that can be played solo or locally with up to four players. 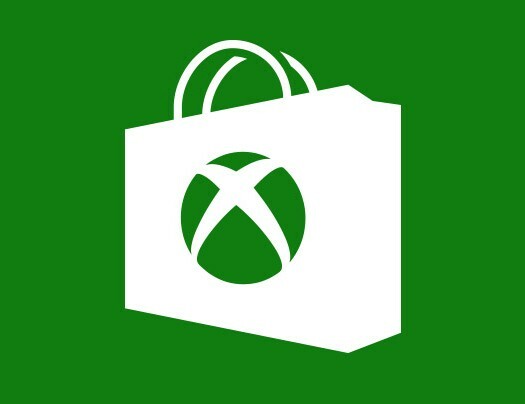 At the time of writing this review, there is no online co-op available. Unless you have friends or family that can play the game with you, you are pretty much stuck playing the game by yourself. This can become troublesome for a few of the bosses. Most of the levels of the game aren’t overly difficult, but gamers may find some areas difficult causing a few deaths and even constant retries here and there. The bosses in each zone, however, raise the difficulty from 1 to 10, which can come unexpectedly for some players. The easiest way to defeat these bosses is to learn their attacks and the patterns of those attacks. 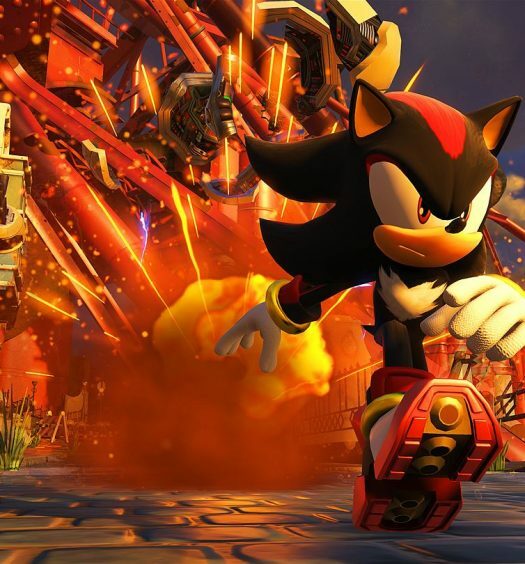 However, other bosses, such as the final boss, have attacks that are virtually undodgeable and avoidance is best left up to luck or trial and error for getting it done. This can be a bit frustrating but manageable to at least finish the game just don’t expect to complete these levels on your first try. 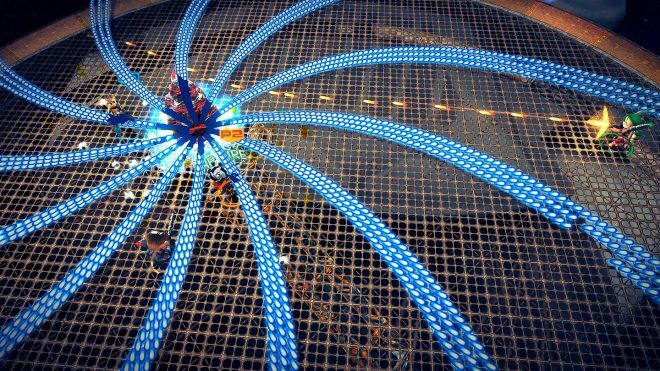 In the end, Assault Android Cactus didn’t meet my expectations; it exceeded them. The five zones that are offered grant a unique experience with each level and boss you face. Some of the bosses can be a bit overwhelming at first, but even with the different attacks they have, the variety of android heroes available to play as assures the player that there is something for every encounter. The different modes that are offered ensure that there is something more for the player to do after the main story has been completed and for a true competition, the game offers the challenge of earning a S+ rank on every level, requiring the player to complete every level without ever letting their combo end. Good luck on that one. Assault Android Cactus was developed and published by Witch Beam. It was released on November 6, 2017, for $14.99. A copy of the game was provided for review purposes.